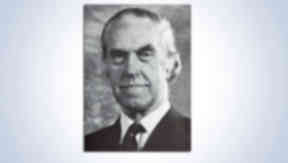 Professor David Maxwell Walker QC, who was Regius Profesor of Law Emeritus at the University of Glasgow, died on Sunday. Tributes have been paid to a "towering figure" in Scottish Law and legal education. Professor David Maxwell Walker QC died on Sunday at the age of 93. He had been Regius Professor of Law at the University of Glasgow until 1990. Professor Mark Furse, head of the University of Glasgow’s School of Law, said: “The School of Law is deeply saddened to learn of the death of Professor David Maxwell Walker. "He was a towering figure in Scottish legal education, who, through his teaching and writing, influenced generations of students, academics and practitioners". Prof Walker married Margaret Knox in 1954 and the settled in the West End of Glasgow. The university said he was an enthusiastic practitioner of what he called "the medicine called canis ambulatio", or dog walking. Prof Walker was educated at the High School of Glasgow, and the Universities of Glasgow, Edinburgh and London. His undergraduate studies were interrupted by the outbreak of World War II, in which he served in India and Italy between 1939 and 1946. After returning to his studies, he graduated as an MA (1946) and the LLB with Distinction from the University of Glasgow in 1948, and was called to the Scots Bar in the same year. He also undertook postgraduate study as Faulds Fellow in Law at the University of Glasgow from 1949 to 1952, leading to conferment of the degree of PhD by the University of Edinburgh in 1952. In 1957, Prof Walker was admitted as Barrister of the Middle Temple, and in 1958 he was appointed Queen’s Counsel. He published books on Scots Private Law including As Regius Professor of Law, David Walker published extensively on Scots Private Law. A University of Glasgow statement said: "The debt owed to him by the Scottish legal profession is immense. His concern in the early days was to supply the lack of textbooks on major areas of Scots Private Law by providing accurate, logical and comprehensive exposition. "His knowledge of law was compendious and unequalled, and any enquirer will set down any of his works enlightened and informed. "He was an inspiring teacher to generations of Glasgow students, who regarded him with respect and awe. "He demanded of himself and of others the highest standard. When asked if ever he was anxious about the number of students whom he had failed, he famously replied that rather he was worried about the ones he had passed. "Those who had the inestimable benefit and privilege of being instructed by Professor Walker will not forget the rigour he required, a rigour which stands in the minds of many as the standard to which to aspire."